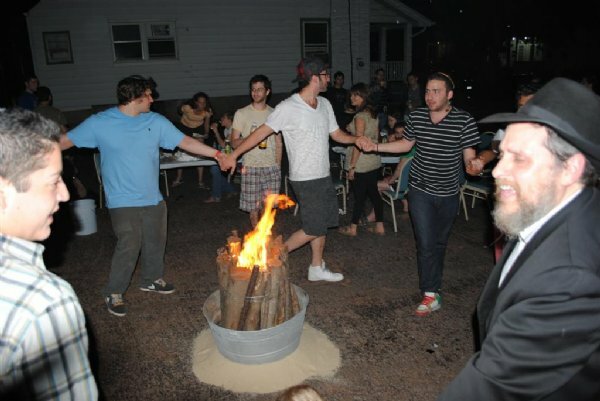 Over 500 college students converged outside the Chabad House at Rutgers University for the Annual Peace, Love and BBQ Lag B'Omer Bonfire this past Saturday night. The combination of a warm evening weather, grilled foods, lots of people to meet, and an inspiring talk and dance to celebrate the day made for a most successful event. The holiday itself commemorates the lives and teachings of two of the greatest Talmudic and Kabbalistic sages in Jewish history, Rabbi Shimon Bar Yochai and Rabbi Akiva," explains Danielle Wald, Social Director of Chabad House. "Rabbi Shimon Bar Yochai is the author of the Zohar, the base text of the 'Kabbala'. Rabbi Akiva was the teacher of twenty four thousand students and a primary leader of the Jewish people. Both of these contemporary spiritual giants enthusiastically taught and lived the Biblical mitzvahs of 'Love your fellow as yourself (Leviticus)' and 'How sweet it is when brothers dwell together as one (Psalms).’ The teachings and lessons learned from the lives of these two sages will make this a day of profound celebration." "The program was phenomenal," exclaimed Chabad VP Benjy Bouskila, a Rutgers junior, “people sang, ate tons of our famous kosher burgers, chicken and dogs, and got really turned on by the spiritual nature of the event." Campus Rabbi, Baruch Goodman, spoke of the great need these days for light and warmth, and how this holiday of Lag B'Omer allows every Jews light to shine brightly when we get together and celebrate the lives of those ancestors who dedicated themselves to bringing Jews together and teaching them Torah. Uri Kapilovich, who attended the barbeque last year as well, echoed Ben's sentiments. “But the looks of this massive turnout, students are obviously responding to the messages Chabad is putting out there on campus,” he explains, "especially how attentive everyone was when the rabbi spoke. It's nearly impossible to get college kids to listen to anything for more than a 15 second sound bite. But what they are hearing is definitely being received well." 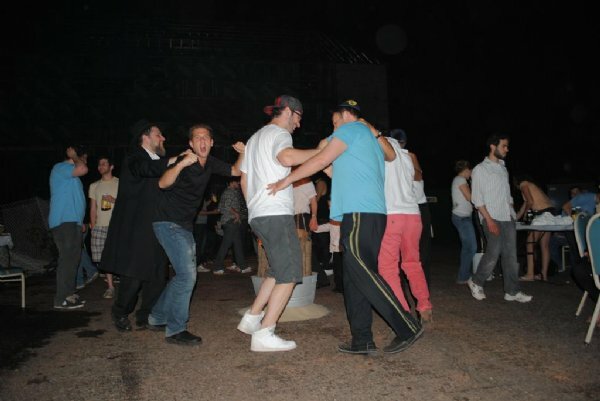 Always occurring 33 days after the beginning of Passover, Lag B’Omer gets its festive nature from bar Yochai, whose mystical teachings form the body of the foundational text of Kabbalah known as the Zohar. Before his passing, he instructed his students to celebrate the day as heralding the dissemination of the Torah’s esoteric wisdom. 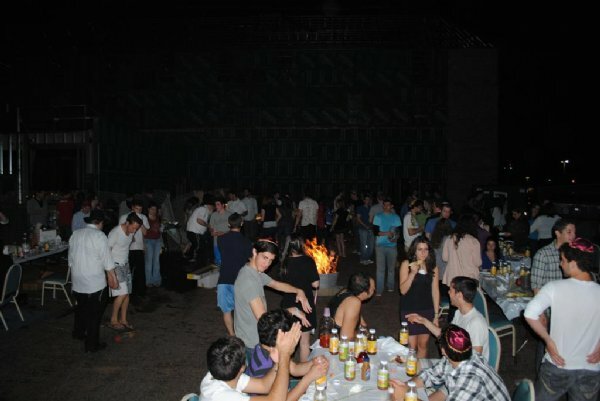 In Israel, the day is characterized by nighttime bonfires in parks across the country, daytime children’s parades, and a gathering of hundreds of thousands of people at bar Yochai’s resting place in Meron. Students hailed not only from Rutgers, but also from the University of Maryland, Baruch College, Yeshiva University, Middlesex County College, The College of New Jersey, and Hofstra University. The event was co-sponsored by Rutgers University's chapter of the historically-Jewish fraternity Alpha Epsilon Pi and the Rutgers Jewish Newspaper L'chaim. 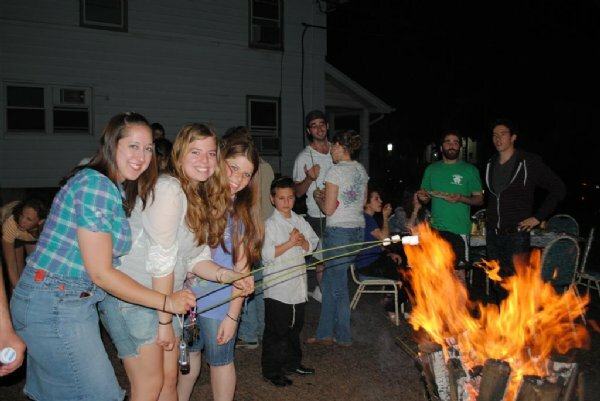 Lag BaOmer, the 33rd day of the Omer count – this year, May 2, 2010 – was a festive day on the Jewish calendar, celebrated with outings (on which the children traditionally play with bow and arrows), bonfires, and other joyous events. Many visit the resting place (in Meron in Northern Israel) of the great sage and mystic Rabbi Shimon bar Yochai, whose yom hilula (anniversary of his passing) the day marks. Rabbi Shimon bar Yochai, who lived in the 2nd century of the Common Era, was the first to publicly teach the mystical dimension of the Torah known as the "Kabbalah," and is the author of the basic work of Kabbalah, the Zohar. On the day of his passing, Rabbi Shimon instructed his disciples to mark the date as "the day of my joy." The Chassidic masters explain that the final day of a righteous person's earthly life marks the point at which "all his deeds, teachings and work" achieve their culminating perfection and the zenith of their impact upon our lives. So each Lag BaOmer we celebrate Rabbi Shimon's life and the revelation of the esoteric soul of Torah. Lag B'Omer also commemorates another joyous event. The Talmud relates that in the weeks between Passover and Shavuot a plague raged amongst the disciples of the great sage Rabbi Akiva "because they did not act respectfully towards each other"; these weeks are therefore observed as a period of mourning, with various joyous activities proscribed by law and custom. On Lag B'Omer, though, the dying ceased. Thus Lag B'Omer also carries the theme of Ahavat Yisrael, the imperative to love and respect one's fellow.